Sony has released yet another TV spot for the upcoming Spider-Man: Into the Spider-Verse. The 30-second clip shows more new footage while focusing the spotlight on Peter Porker, a.k.a. The Spectacular Spider-Ham. Comedian John Mulaney provides the character’s voice in the new animated film. Created by writer Tom DeFalco and artist Mark Armstrong, Spider-Ham made his first appearance in the Marvel Tails one-shot in 1983. Two years later, the character was given his own bi-monthly series that ran for 17 issues. In the comics, he was originally a spider named Peter who lived in the basement lab of scientist May Porker, an anthropomorphic pig. After creating an atomic-powered hair dryer, May accidentally irradiated herself. She subsequently bit Peter, turning him into a pig who retained his arachnid abilities. Donning his own costume, he dedicated himself to fighting parodies of established Marvel rogues. Throughout his adventures, he also ran afoul of animal-themed takes on other Marvel heroes, including Hulk-Bunny and Captain Americat. Apart from his own series, Spider-Ham has also appeared in two major crossover events featuring the traditional Peter Parker version of Spider-Man. He first showed up in the 2014 Spider-Verse storyline written by Dan Slott, joining the fight against Morlun and the Inheritors. The character returned a year later in Secret Wars, where he ended up on Battleworld alongside several other Spider-Men and Spider-Women. The character has made additional appearances in cartoons (most notably in DisneyXD’s Ultimate Spider-Man) and video games. You can watch the new TV spot via ComicBook.com below. Spider-Man: Into the Spider-Verse swings into theaters on December 14. 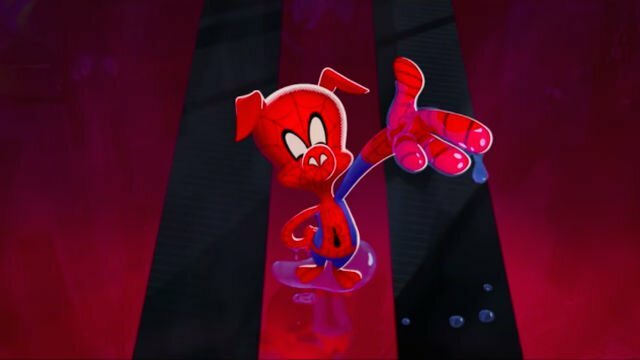 Are you excited for Spider-Ham to finally make his cinematic debut? Share your thoughts in the comment section below!